I haven’t had much luck with making pasta salad in the past. It always seemed to be lacking in flavor and pretty mediocre. We decided to grill kebabs last week and enjoy our first dinner out on our patio. I thought pasta salad sounded like the perfect side item. 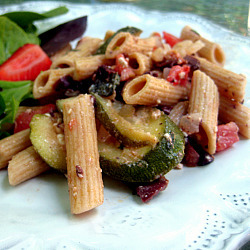 I read through several recipes from Gourmet on Epicurious and this recipe for Whole-Wheat Pasta Salad with Zucchini and Olives sounded like a winner. We love Mediterranean flavors and I didn’t see how this could be boring with zucchini, olives, onions, tomatoes, garlic, fresh basil and feta. I made a few modifications to the recipe. First, I made the pasta salad ahead of time (wanted to go to a late yoga class!) so I skipped grilling the zucchini in favor of a quick saute. Second, I just do not love the flavor of raw onions and garlic so I gave those a quick saute too (and subbed Vidalia’s for red onions because they were on hand). 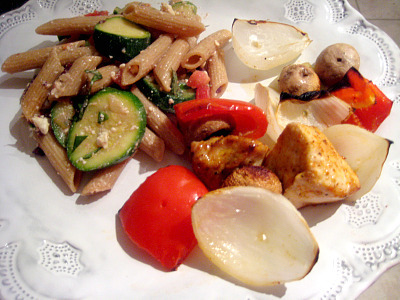 I loved the flavors of this pasta salad and enjoyed the leftovers for lunch the next couple days. I cut the recipe in half and it still made a ton. 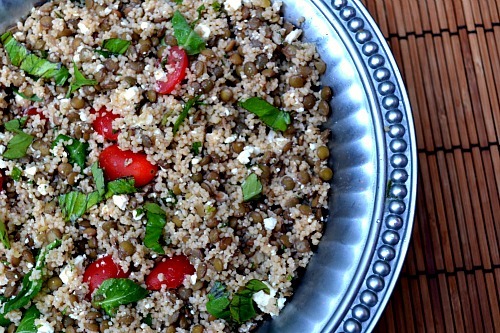 This would be great for entertaining or to make for lunches for the week. I will most definitely be making this recipe again soon. In a large bowl gently stir together tomatoes, onion, garlic paste, vinegar and olive oil. Set aside. Brush one side of zucchini slices lightly with additional oil and season with salt and pepper. Heat a well-seasoned ridged grill pan over moderate heat until hot and grill zucchini, oiled sides down, in batches, brushing tops with more oil before turning, 1 to 2 minutes on each side, or until just tender but not soft. Transfer to a small bowl. In a pot of salted boiling water cook pasta until just tender (following package directions) and drain. Add hot pasta to tomato mixture and toss to combine. Cool pasta slightly and stir in zucchini, olives, cheese, basil and salt and pepper to taste.